Many aeroplanes crashed in the UK during the Second World War, some as direct casualties of conflict shot down by anti-aircraft fire or in aerial combat, some because they just could not get back to base after sustaining earlier damage. What is lesser known is that in the years immediately following the war navigational and weather problems also led to crashes and the Peak District of Derbyshire seems to have had more than its share of these. Several years ago I became intrigued by a story about a wartime aeroplane crash site featured in Blood on the Tongue, a crime novel by Stephen Booth. 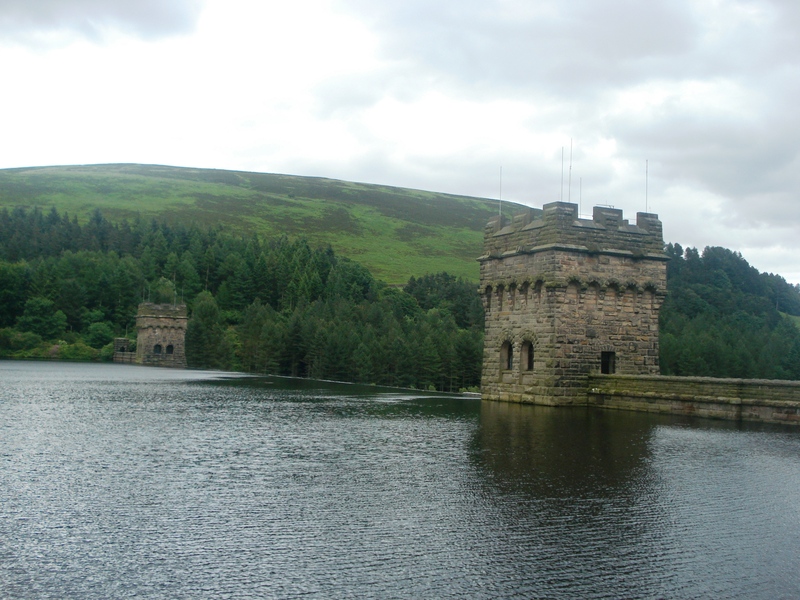 Set in the Peak District, Booth’s geography is fictional, based on a mixture of features drawn from all over the area, but a possible inspiration for the story may have been wreckage still to be found on Bleaklow, east of Glossop. Intrigued by Booth’s fiction, I decided to visit this crash site, which is known to have a memorial. In 1948, a United States Air Force (USAF) Superfortress crashed near a remote moorland hilltop. It was delivering mail from RAF Scampton in Lincolnshire to USAF Burtonwood in Cheshire. The crash occured by a cruel trick of fate: if the aircraft had been ten metres higher it would have cleared the hilltop and would probably have reached its destination. In view of the location, careful preparations had to be made for my visit to the crash site. Amongst the problems of walking in the Peak District are weather conditions, which can change very quickly, and the sheer isolation. After postponing the walk on the first attempt due to heavy rain, I set off with a colleague equipped with walking gear, maps, compass, gps equipment and whistle (no mobile phone signal in these parts) and emergency rations. The moorland is not called Bleaklow for nothing and we were not keen to become the subjects of one of Derbyshire’s several mountain rescue teams. In the event, weather conditions were good and leaving Snake Pass, good progress was made along the Pennine Way. After walking for one and a half hours the crash site was reached. The last kilometre was off the path and through boggy peat moorland. Wreckage still covers a huge area and is in remarkable condition after sixty years. Some of the steel components of the undercarriage and engines are now quite rusty but most panels merely possess the patina typical of oxidised aluminium. A few stainless steel components seemed as bright and shiny as the day they were fashioned. Despite its remoteness the site receives many visitors and has developed the characteristics of a shrine. Many crosses have been constructed; some by repositioning pieces of wreckage, but others are formed from rocks placed in patterns on the bare peat. At least one of these is visible from the air, as users of Google Earth can confirm! One large piece of panelling forms a rudimentary shelter over a mound of peat which has become covered with wreaths, tributes and small British Legion crosses. 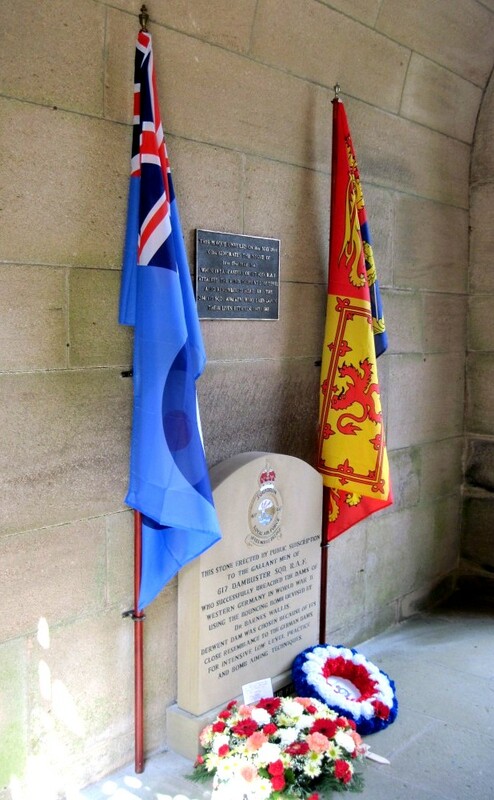 Amongst this scene stands the subject of the visit: a sandstone pillar bearing a bronze plaque commemorating the thirteen airmen who lost their lives in a tragic accident. It’s 90 years to the day that the Royal Flying Corps and the Royal Naval Air Service were merged to form the Royal Air Force (RAF). There are a great many war memorials that commemorate the members and actions of the RAF – over 800 if we search the database for ‘RAF’. One notable, recent memorial (unveiled in 2005) is the Battle of Britain Memorial on Victoria Embankment, London. It features friezes cast in bronze depicting scenes from the Battle, during 1940. These include: pilots at rest; members of the Observer Corps watching for an attack; ground crews arming hurricanes; pilots scrambling; pilots sharing stories in the mess hall; hop pickers in Kent watching an aerial battle; anti-aircraft gunners; women working in an aircraft factory; a pilot closely pursued by a Luftwaffe plane; St Paul’s Cathedral surrounded by smoke from the Blitz; people searching the ruins after an air raid; and a family making tea in an Anderson shelter. 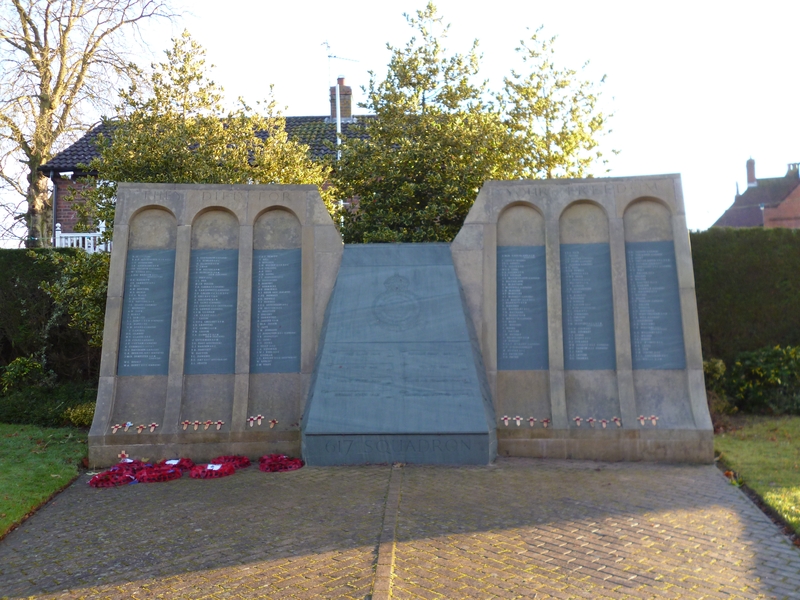 The memorial also lists the names of 2935 members of the RAF who served or died during the Battle of Britain. Also in London, you will find many RAF memorials in St Clement Danes church. The church was gutted by fire in 1941 and rebuilt by the RAF to become their central church, commemorating personnel killed on active service. Another very significant memorial is the Air Forces Memorial to the Missing at Runnymede, built and managed by the Commonwealth War Graves Commission. It is a large shrine that commemorates over 20,000 airmen by name, who were lost in the Second World War during operations from bases in the United Kingdom and North and Western Europe, and who have no known graves. On a window of the shrine, is a poem written by Paul H Scott. Members of the Air Transport Auxiliary – pilots who ferried planes in the Second World War – are to receive a new award recognising their contribution to the war effort. The ATA was made up of trained pilots who were ineligible for a combat flying role. This included men who were too old or unfit, women and foreign nationals. Among them were pilots like Stuart Keith-Jopp, a 50-year-old First World War veteran who’d lost an arm and one eye. In all 1,152 men and 166 women served as pilots, with a number of engineers and ground crew. Thirty different nationalities were represented. The ATA ferried training aircraft, fighters and bombers around the country on behalf of the RAF, often flying aircraft they had little experience with. The most qualified pilots were expected to fly up to 147 different types of aircraft. They had no radios and little in the way of instruments, making flying in bad weather particularly hazardous. German fighters were also a very serious threat as the planes were invariably unarmed. Over 150 members of the ATA were killed and a small number of war memorials record their service. These include a tablet in St Paul’s Cathedral, unveiled in 1950 and a recently unveiled memorial stone at Manchester Airport Memorial Gardens. The photo above dates from 1939 and shows the first nine women pilots in the ATA. At the far left is Pauline Gower, the Commandant of the women’s section. She was a commercial pilot before the war and was instrumental in the decision to allow women to fly in the ATA. Sadly she died in 1947, shortly after giving birth. The other members (left to right) are Mrs Winifred Crossley, Miss M Cunnison, The Hon. Mrs Fairweather, Miss Mona Friedlander, Miss Joan Hughes, Mrs G Paterson, Miss Rosemary Rees and Mrs Marion Wilberforce. The founding members all survived the war, with the exception of Flight Captain Margaret Fairweather, who was killed in August 1944. Margaret had been the first woman to fly a Spitfire. Her husband, Captain Douglas Fairweather, was also an ATA pilot and was killed four months before his wife. They are buried together in a joint grave tended by the Commonwealth War Graves Commission.